Silhouette CAMEO Essentials Starter Bundle Just $189! Down From $378! 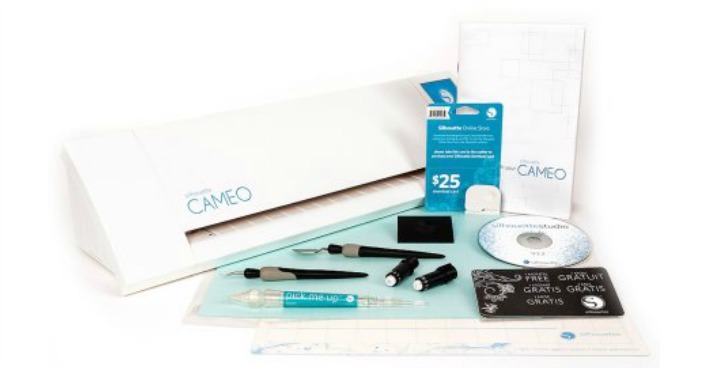 You are here: Home / Great Deals / Silhouette CAMEO Essentials Starter Bundle Just $189! Down From $378! Right now you can get this Silhouette CAMEO Essentials Starter Bundle for just $189 (Reg. $378) at Walmart! Get creative with your crafting projects when you use the Silhouette CAMEO Starter Bundle. Much like a home printer, it can be quickly and easily hooked up to your Mac or PC using a simple USB cable. Once it is connected, you can use it to cut paper, cardstock, vinyl, fabric and more. This scrapbooking starter kit also has the ability to register and cut printed materials. It allows items up to 12″ wide and 10′ long, so you can use your imagination to create fun and exciting projects. The Silhouette CAMEO essentials bundle comes with a $25 silhouette studios gift card and has what you need to get started. The AC adapter, power cable and USB cable are included so you can get set up right away. If you’re not familiar with how to use it, simply reference the included instruction guide and instructional DVD. It also comes with a one-month basic subscription to the Silhouette Online Design Store so you can pick some patterns. Get started today with the Silhouette CAMEO Starter Bundle. t.